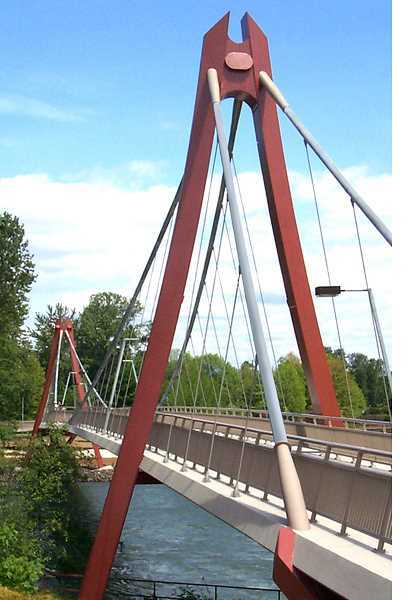 Suspension and cable-stayed are the least obtrusive options for bike/pedestrian bridge across the Willamette River. After Wilsonville City Council decided this summer that the French Prairie Bridge would align with Boones Ferry Road, the City and other interest groups have turned their attention to the type of bridge that would run across the Willamette River. 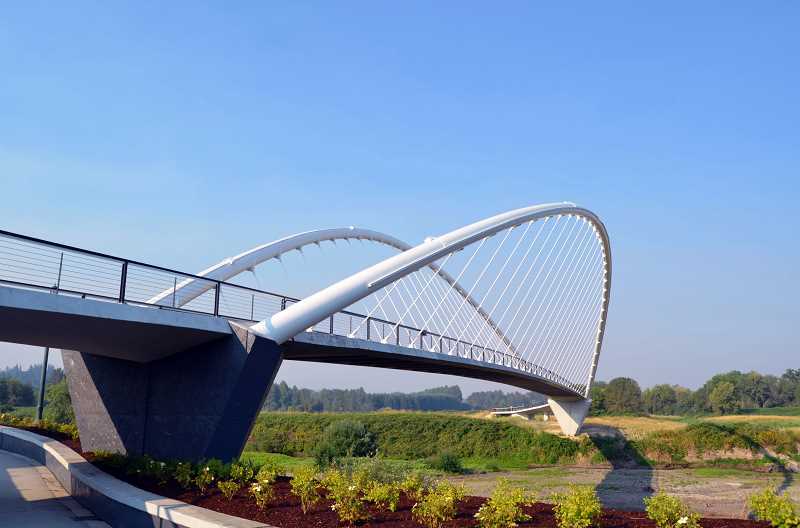 The City unveiled five potential bridge types and discuss the project, which would place a bridge for bikes, pedestrians and emergency vehicles across the Willamette River on Oct. 18 at Wilsonville City Hall. After receiving public input, which also includes an online open house at frenchprairiebridgeproject.org/, the French Prairie Bridge Project Advisory Task Force will recommend which two bridge types should be further studied and then the council will have the final say. Following the study, the council will select a bridge type. "This (the open house) is a 10,000 foot look at these bridge types and when it gets to a preferred (bridge type) we'll do a more detailed analysis and then more so if this project were to move forward," said Zachary Weigel, the Wilsonville capital projects engineering manager. The bridge types include steel girder, steel truss, tied-arch, cable-stayed and suspension. Though project staff haven't calculated site-specific cost estimates, Weigel said the steel girder and steel truss options, which are used for the Boone Bridge and the Steel Bridge in Portland respectively, are the least expensive but would require piers to be entrenched in the Willamette River, which would force the City to have to remove river bank material. Also, construction would cause the riverway to be closed for a temporary period. "Piers in the water has a higher environmental impact," Weigel said. "It can be challenging because if you have to remove material along the bank and that has an impact on the vegetation and the trees along the bank." These options would additionally require a pier to be placed in the Boones Ferry Marina parking lot, which would require the loss of one parking space. Tied-arch, which is used for the I-405 Fremont Bridge in Portland, is the most expensive bridge type and would cost about 90 percent more than the steel truss and steel girder options, Weigel said. It would require the piers to be placed on the river bank rather than in the middle of the river and would also require a pier to be placed in the marina. However, the cable-stayed and suspension bridge types, which are used for the Tilikum Crossing and St. Johns Bridge respectively, would be long enough to avoid the placement of obstructive piers and are projected to be a bit less expensive than the tied-arch type. Weigel noted that the aesthetic qualities of each bridge-type will be considered but that project staff will not weigh in on that aspect. "That's something we want to get feedback back from the public on," Weigel said. Along with the bridge types, City staff will provide general information about the project. "We will have information about the whole project there (at the open house) for people that haven't been following the project from the beginning," Weigel said. "If people want to get caught up on what the project is and what decisions have been made in the past and what the plan is going forward, participating in the online open house or going to the open house would be a good opportunity to do that."